NEW YORK (Reuters) - The United States "absolutely must" complete unfinished work ending the too-big-to-fail bank problem that helped plunge the global economy into recession eight years ago, an influential Federal Reserve policymaker said on Saturday. 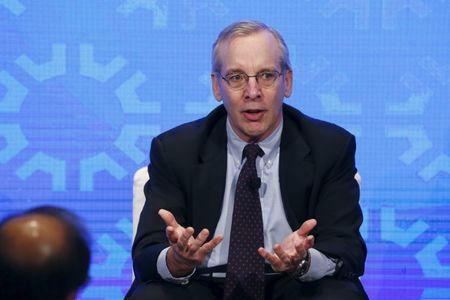 In remarks that appeared to pre-empt President-elect Donald Trump, who has promised to roll back Wall Street regulations, New York Fed President William Dudley said much progress has been made making the financial system "less prone to panics." "Still," he said in prepared remarks, "there is more to do before we can say that we have ended 'too big to fail.' This is work that we absolutely must complete." Dudley's comments, to a Group of 30 meeting of top world regulators, came a day after another powerful regulator at the U.S. central bank, Daniel Tarullo, also warned against "backsliding" after years of implementing the landmark 2010 Dodd-Frank financial-reform law. Challenges especially remain in regulators safely and smoothly handling the hypothetical failure of a massive bank with operations in multiple jurisdictions, Dudley said. Addressing other areas of the financial landscape, Dudley, whose institution acts as the Fed's eyes and ears on Wall Street, drew a line around these areas he said provided important structure changes: reforms in tri-party reverse repurchase market; in over-the-counter derivatives and the central clearinghouses that handle that activity; and in money market mutual funds. Trump, a Republican whose victory last month shocked pollsters, has said his administration will grow the economy in part by rolling back elements of the Dodd-Frank Wall Street reform law.